The new movie version of "Spider-Man" sticks to the original story threads of the friendly, neighborhood web-slinger. The film, which opened Friday, stars Tobey Maguire as the superhero and his alter ego, Peter Parker, in a plot that revisits the original story of the nerdy schoolboy who gains the power to climb on walls after being bitten by a peculiar spider. There are some key differences, however. This time the spider is genetically engineered — not radioactive — and Spidey's famed web-shooters are an organic mutation in his arms — not mechanical devices he invented. The fidelity of the movie contrasts the somewhat erratic story lines of the comic series over the years: Both Mary Jane and Aunt May have died and come back to life; an "alien symbiote" took over Spider-Man's body in the form of an organic black costume; Spider-Man has also sprouted four extra arms and done battle with everyone from Dracula to drug dealers. The road to filming the movie wasn't smooth, either. To hear the makers of the film tell it, getting the new "Spider-Man" movie made was as sticky and tangled as any web the superhero shoots from his wrist. For more than a decade, the film was mired in bankruptcies, lawsuits, director changes and even a Sept. 11 controversy over advertisements showing the World Trade Center twin towers. The makers of the film say the wait may have been a good thing after all - good for them, good for the movie. So good, in fact, they are already planning a sequel. "You couldn't have made it 15 years ago," said Avi Arad, executive producer and Marvel Studios chief. "It needed special effects that weren't in place until, probably, 'Terminator 2 (Judgment Day, 1992).'" The wait brought about the assignment of director Sam Raimi, whose taste for the cinematic arts varies from science-fiction thriller "Darkman" to independent hit "A Simple Plan" with its tale of modern-day greed among ordinary people. Raimi, 42, campaigned hard for the job because he grew up reading the Spider-Man comics and felt he knew what Spider-Man's alter-ego, the young Peter Parker, was all about. As a Spider-man fan himself, Raime told CBS News he was intimdated at the thought of trying to please all the web-slinger's other fans. "Spider-Man has a tremendous fan base. And all the fans have opinions about what I should or shouldn't do in the picture. They didn't like some of the casting choices I made. Some didn't like the story choices I made. 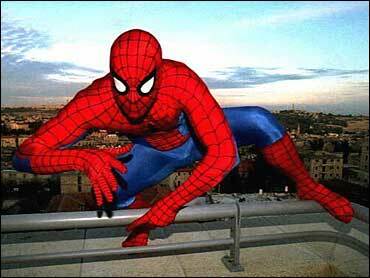 And more than anything, I wanted to please these fans," says Raimi. "But finally, I told myself I just should shut that off, not listen because the best way to please the fans would be to follow what, in my heart, I loved about the Spider-Man character. And bring that to the screen. And in so doing, try and please them in that way." Read more of the interview with Raimi. It is Raimi's combining of the type of dizzying special effects needed for sci-fi thrillers with the humanity of a film like the critically acclaimed "Simple Plan" that is fueling strong, early word-of-mouth for "Spider-Man" in Hollywood. The delays also gave time for actor Tobey Maguire, 26, to mature in films such as 1997's "The Ice Storm" and 1999's Oscar-nominated "The Cider House Rules." He became the kind of actor who could inject a heart into Spider-Man and add some soul to all the muscle-flexing that goes into action flicks. Parker, Raimi said, was raised in a working-class family, never gets the girl, is really uncool, and lies awake at night wondering if all this superhero stuff is worth it. "Peter Parker, unlike Superman, is really one of us," said Raimi, referring to that faster-than-a-speeding-bullet fellow from the planet Krypton. He's sort of like Tarzan swinging through the jungle on vines, although in Spider-Man's case, the jungle is New York and the trees are skyscrapers. Raimi's "Spider-Man" is all about that basic instinct that drives all young men and thrills young women. Parker just wants to score a date with the girl of his dreams. In this case, it is high-school sweetheart and red-haired flame Mary Jane Watson, played by Kirsten Dunst. "I usually don't like these kinds of movies, but this one has a good heart and a good romance and a good superhero," Dunst said. "He's, like, still charming and dorky ... and he's not like a super-hunk."